It is refreshing, stimulating and energizing. It is not only wonderful for clearing breathing passages but goodness of coconut oil and cocoa butter, skin feeling soft and super hydrated. Clary Sage helps in soothing feelings of anxiety and frayed nerves. Our reputed entity is engaged in supplying Bath Bomb. We are a top-notch organization, engaged in providing Bath Bomb. 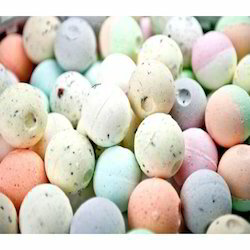 In order to meet excellent quality standards, we are supplying Bath Bomb. We are amongst the most reputed names in the industry, offering Bath Bomb. used for making spherical or ball shape products. Sariraa's mini bath bombs are good for travel.they are good for homemade manicure n pedicure. We are engaged in offering Aromatic bath bomb to relish you bathing sensation. 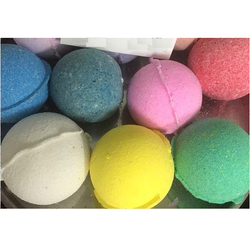 In order to meet excellent quality standards, we are supplying Bath Bombs. USAGE : Dissolve the entire bomb in warm water. Soak & sit back in the tub for 15-20 minutes. Wash off and dry the skin with a towel. INGREDIENTS : Sodium Bicarbonate, Citric Acid, Cornflour, Vegetable Glycerine, Sunflower Oil (Helianthus Annuus), Green Tea Leaves (Camellia Sinensis), Fragrance. We are engaged in offering Bath Bomb.